This recipe for Barley Gruel comes from John Knots 1724 cookbook called “The Cooks and Confectioners Dictionary”. Boil the barley in 1 quart of water changing the water out as needed until it comes out clean. Add in currants and allow to boil for about an hour then remove from heat and allow to cool. Mix together egg yolks, cream, white wine, and lemon zest. Make sure that your barley is cool enough that it will not cook your eggs, then add to your egg mixture. 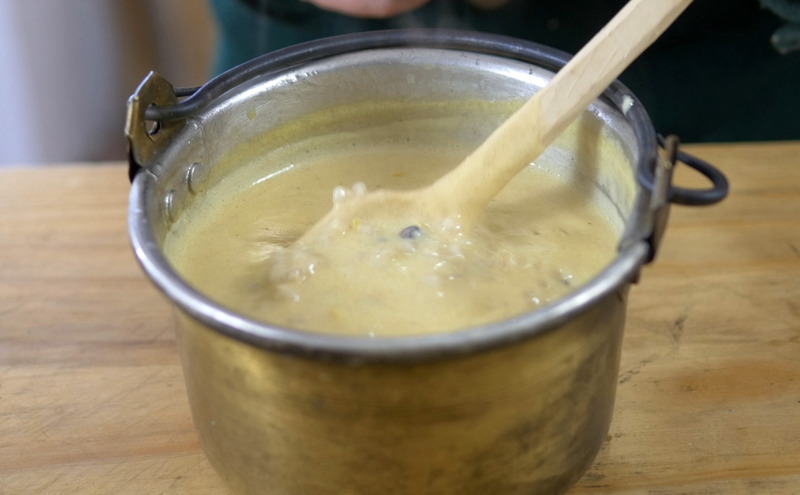 Place your gruel into a pot and heat on low stirring constantly until the mixture starts to thicken. Remove from heat, allow to cool and sweeten to taste. So, today’s recipe sounds horrible, barley gruel, but let’s find out. Thanks for joining us today on 18th Century Cooking with Jas. Townsend and Son. The recipe for today comes from John Knots 1724 cookbook called “The Cooks and Confectioners Dictionary” and you know, it starts off with something pretty simple, he wants us to make barley water with 3 ounces of barley and a quart of water so I’m going to put this quart of water on to boil and then we’re going to add in our 3 ounces of barley. He also talks about making sure that our barley is white and if your barley is like my barley, you’ll start boiling it and you’ll get this kind of scum that comes up to the surface and you’ll want to skim that and you’ll get maybe sort of a brown barley water out of it and what he wants is the nice cleaner water so he talks about shifting the water once or twice so once it’s come up to the boil and some of the scum has come up to the surface, we’re going to drain this off and put more water back in, again about a quart. We don’t want to put in too much more, and let this boil. As it’s boiling we can add in our currants. He asks for about 4 ounces of currants in this situation. You could use raisins instead, really the currants aren’t the important part of this, so a little less or a little more really isn’t’ that important. 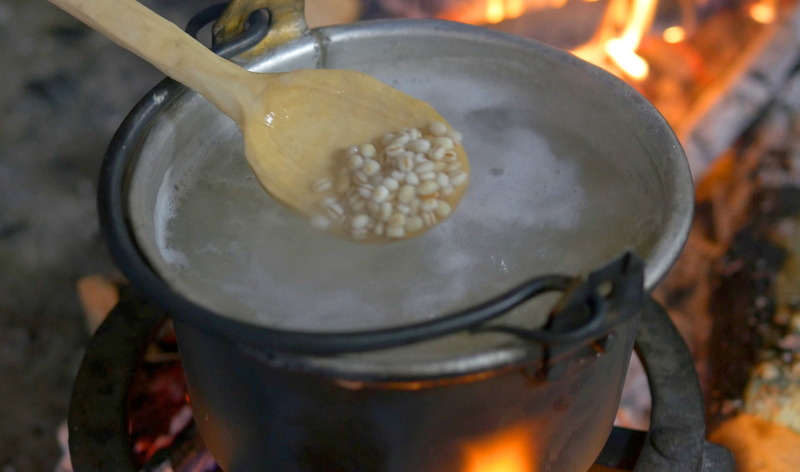 To get your barley nice and tender, you should boil it about an hour. So our barley is basically done. It’s ready to go. We need to let this cool and we’re going to start making this other mixture that we’re going to add into it, so let me set this aside to cool and now let’s work on our other mixture. We need 3 egg yolks. He calls for a half a pint, it may actually be 10 ounces, of cream. Also, some white wine, the same amount, also about a cup. Also some lemon zest, it’s about a half a lemon peel that I zested up. Now our mixture is stirred up, I’ve got our gruel, I’m going to go ahead, for the sake of mixing it up, I’m going to put it into the mixing bowl, but we’re going to need to heat this up, so we’ll put it back into a vessel we can heat with. You want to make sure that this is cool enough though that it doesn’t cook our eggs as we add this in, and you can tell by this time that the barley should have absorbed a lot of that water. It’s not nearly as liquidy as it was in the beginning. Now that this is mixed up, we can put it back in our vessel here. We’re going to put it on a low heat and make sure to stir it constantly until it starts to thicken. I’ve let this cool a little bit. The recipe says to sweeten to taste so I’m just going to add a little bit of sugar here and mix it in and hopefully it’s cool enough that I can try it out. Mmm, whoa, that’s the best gruel I have ever had. This is really good. All the flavors are there. You get a little bit of the wine flavor up on top. If you want to use just a sparkling grape juice you can get the same kind of flavors here that the wine’s going to give you, at least a little bit, if you don’t want to use an alcohol, but you get all these different flavors coming in that we had with the little bit of spices, that lemon in there, the sweetness also, the thickness of this custard is wonderful and those little textures of the barley in there. 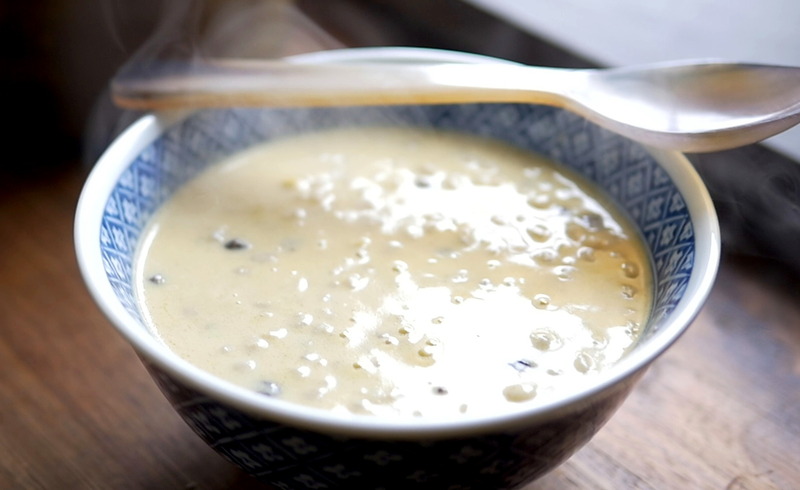 They’ve been cooked so long that they’re very soft, just like a tapioca would be and tapioca wasn’t in the 18th century, at least in an English context, so this is probably as close as you’re ever going to get to a tapioca pudding in the 18th century. Wonderful. If you get a chance to make up this barley gruel, you will enjoy it, I promise you. I want to thank you for coming along as we’re experimenting, as we’re savoring the flavors and the aromas of the 18th century. If you’re new to our channel, I want to welcome you. You can subscribe by clicking the button right up here. Also check out our related videos. Thanks so much for watching. This entry was posted in 18th Century Cooking, Historic Cooking, Ingredients, Recipe, Video and tagged Breakfast, gruel, oatmeal, porridge. Bookmark the permalink.